When God created mankind male and female, he created us in his image. Among other things, bearing the imago dei means each of us is both valuable and relational. We possess inherent value because out of his entirely good creation that he treasures, the Creator of the universe has shaped us to be uniquely precious. Men and women, boys and girls, are a priority to us because they are a priority to our King. In addition to that value, bearing God’s image also makes us relational creatures. As those who reflect the nature of a Creator who has always existed in perfect relationship – Father, Son, and Holy Spirit together in one Godhead – we naturally need each other. In fact, the first “not good” thing about God’s good creation was that it was not good for man to be alone (Genesis 2:18). God did not design us to be isolated but rather to experience the reality of his love, where we are both deeply known by others and at the same time deeply loved. 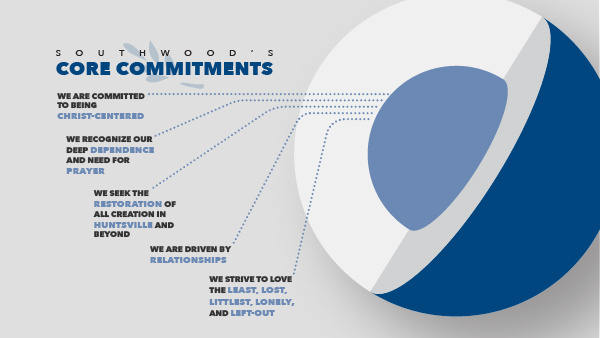 We want everything we do at Southwood to reflect that priority. People are more important than programs because they bear the image of the God we worship. To be fair, our heart is that programs and ministries would not be pitted against people and relationships but rather serve to aid and facilitate those relational priorities. But this commitment means that creating opportunities for sharing life together is a vital part of what we do in everything that we do. Many people do great kingdom work that is Christ-centered and God-exalting without focusing on relationships. Think, for example, of a radio broadcast ministry or a web-based theology site that teaches and equips people around the world without ever meeting any of them or having a single conversation. But Jesus has called his Church specifically to live in community with each other and our neighbors to model the relationship God so values with us. This commitment is reflected briefly in the greeting time we have during most of our worship services, but the relational ministry the Gospel calls us to is much deeper than a handshake and a hello. This is the reason why our sermons and classes don’t address merely how to think but also how to live in relationship with others. This is the reason why our small groups learn not only about God’s Word but also about each other and where God’s truth and God’s people can show up in the hard places of life. This is the reason why when serving people in Huntsville or in India, we seek to give not merely our money but actually our very selves in relationship with those God has called us to serve. Our world is full of people bearing God’s image yet struggling with isolation and conflict (lack of true relationship and broken relationships). Thankfully, in the midst of that pain, God has given us the ministry of reconciliation. The hope Jesus offers centers on a restored relationship with our Creator-Father, who knows us completely and loves us completely, and that reality brings us into restored relationships with many other valuable image-bearers with whom we get to share the gospel of Jesus and our very lives.